What kind of aircraft may land on iced areas, like Antarctica? I know some aircraft may land on iced surfaces.  what are the difficulties associated and is this limited to specially designed aircraft. Is there some conditions necessary for the landing and the next takeoff. Where are the main iced airfields currently active? Yes it could, same way it would preform an emergency landing any where else. There are ice runways out there and its not all that uncommon to see small GA planes landing on frozen lakes in the winter. There are considerations when it comes to breaking and what not but in the end of the day you have the ability to always land into the wind (since you are picking your touch down heading provided there are limited obstacles). Landing into the wind is also key as a result of some of the potentially high winds in the arctic and antarctic shelves. The largest issue is not knowing how thick the ice is. While I don't know an enormous amount about north or south pole geology the ice thickness varies and in some places could not support an aircraft landing. For the most part the south pole ice is very thick (9000ft) by all estimates, but the outer edges and the ice that does not reside above the landmass could be thinner. Keep in mind that parts of the arctic/antarctic are in total dark for a part of the year so you may be looking at nigh procedures when landing. Interestingly enough, Antarctica actually has 20 airports so you may even be able to put down on a strip depending on where you are. I've spent 6 summers in Antarctica (Mt. Erebus), travelling through McMurdo, where the busiest airstrips on the continent are. Most flights to McMurdo are on C-17s or C-130 Hercules. 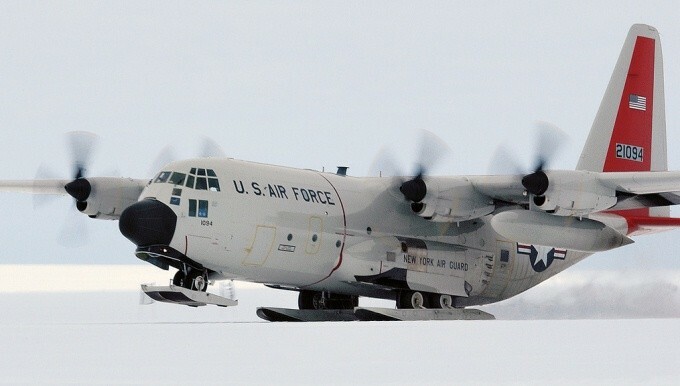 Some of the Hercules are LC-130 -- the L indicates that they have skis. The skis enable them to land and take off on some including ungroomed or poorly groomed snow / ice surfaces. Sometimes they need JATO for takeoff, though, if the conditions aren't great. McMurdo has three runways which open and close operations during the year: Willy Field, Pegasus, and the Ice Runway. The Ice Runway is on sea ice and the other two are on the Ross Ice Shelf with Pegasus built on blue ice and Willy Field on snow. The Ice Runway breaks up each year during the height of the summer so it is carefully monitored. It bends downwards each time a C-17 lands. That deformation is measured and is one of the parameters that's used to decide when to stop using the Ice Runway each year. 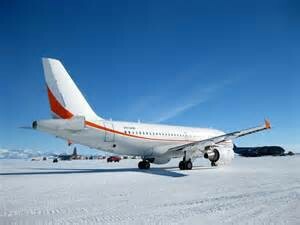 Sometimes, planes designed for non-military use are flown to McMurdo; the New Zealand Antarctic program often flies an Airbus A319 there. As far as I know, a well-groomed snow / ice runway can accommodate any plane in good weather. A Boeing 757 flight to McMurdo from Christchurch had a scary incident recently where it was forced to land in low visibility because it didn't have enough fuel to "boomerang" back to New Zealand. The C-17s often boomerang due to bad weather. The Hercules, like the 757, don't carry enough fuel to boomerang, but they are better at landing in inclement conditions so it doesn't seem to be an issue. For flights within-continent, Twin Otters and Baslers are in common use. No, there's no military presence with offensive capability. I don't really understand this (recently added) part of the question -- did you think they'd hit you with antiaircraft??? There's a bunch of air force guys who operate the flights, and a single US Marshall in McMurdo. When the ice is plowed it scratches it up and that provides enough of a friction that landings are fairly normal, like landing on concrete. There are ice runways in Greenland that are used regularly. Not the answer you're looking for? Browse other questions tagged landing or ask your own question. How do aircraft land on snow? Does landing in extreme weather conditions require any different or special training? Can jet airplanes operate on 'rough' airfields? Can seaplanes land on normal airfields or in a marsh or muddy area? Why don't modern aircraft have landing gear that can swivel to compensate for crosswinds? What happens if an aircraft declares an emergency while there is another aircraft ahead cleared to land? Is is possible to land a midsize commercial plane on an Ford Class aircraft carrier? Why didn't planes land from the sea in the old Kai Tak Hong Kong airport? What's the appropriate course of action if an airliner bounces 5-10 feet on touchdown? Why are landing-distance and rejected-takeoff certification tests performed without thrust reversers?